Ed Schilling is the branch chief of the NASA Ames Video and Graphics Branch (code JIT). He is an experienced videographer and document maker, producer, editor, and film director. The following are excerpts from an interview with Avid. The full text is given here. The Video Production Group grew out of the still photography branch at Ames, and emerged as a separate group in the late 1980s. The group's core staff numbers seven, and they have to be versatile. "All but one of them operates a camera at various times," says Group Chief Edward Schilling. "Three are experienced videographers/cinematographers, four are qualified Avid editors, one is a dedicated audio engineer/composer, one is a scriptwriter, and one is a lighting director." Schilling adds that outside contractors are also brought in as the work demands. "We sometimes bring in freelance videographers and grip/lighting people," he says. "And our animation facility is operated by a few animators who work on a per-job basis." Schilling says the purpose of his group is "to provide a full range of support services on site for all kinds of video needs here at the Center." We're a one-stop shop for everything from very simple digital file conversions to polished HD productions and multi-camera live broadcasts that go out via NASA TV to the rest of the world. The staff members work with various research areas to document experiments and develop new imaging techniques. We also act as technical representatives on larger NASA initiatives, such as the Digital Television Working Group and the Scientific and Technical Information group, which collects data and imagery from all NASA research. We've done several productions for FEMA, which we shot on location in Northern California, Pasadena, Kentucky, and American Samoa. We've also done some image analysis work for a few local police departments. On the technical side, we do a lot of project documentation-going into laboratories, research aircraft, wind tunnels, and remote locations around the world to capture activities and results. This generates hours and hours of footage. Some of it is reference material for analysis or further research, but we also use it to put together a lot of informational video programs for researchers who need to communicate the nature and results of their work. These programs are aimed at a wide variety of viewers, including other researchers and colleagues, reviewers at NASA Headquarters, Congressional briefings, and students. A lot of our work is also in support of public outreach and education. There has been a big push in the last seven or eight years to tell NASA's stories to the public. We do a lot more than just put people into space; NASA technologies are used in hospitals, schools, commercial industry, and even in everyday objects around the house. We put these stories into Video News Files with enough raw footage for a news editor to tell a story: sound bites from researchers, B-roll, and animation. These run daily on the NASA TV satellite channel, and they are pulled down by networks and local stations. Perhaps the most high-profile projects are our live television news conferences, such as for the Galileo Space Probe arriving at Jupiter or the Lunar Prospector probe discovering ice on the moon. These are four-camera shoots using our remote production truck, with roll-ins, graphics, incoming questions over phone lines, and local Q&A from the media. Almost all of the broadcast-level work we do is now shot on HD. We have the Sony HDCAM system, which is 1080i. This includes the model 700 camcorder, the model 500 deck with built-in downscan option, a 14-inch field monitor, a monitor control panel, and A/D and D/A converters for signals from computers. With the NTSC downscans we can edit off-lines on our Avids, and take the EDLs to an outside facility for the online. Because we have the ability to downscan to NTSC, we can do all the posting in the normal way on the Avid, but still have the original HD tape on the shelf for future HD productions. We've been shooting mostly HD for almost two years now, and we've been able to build up a lot of source footage that will be extremely useful when we install an HD online system. Our animation studio includes three SGI machines-a two-processor Octane, an 02 and an Indy. These have been running Maya and Power Animator programs. We also have a Macintosh G3 networked with those machines for file transfers, and for doing AfterEffects, Photoshop, and Illustrator work. The Mac has also been used for converting digitized video files for streaming. Our animators either import 3D models from a researcher's computer, or build a model from scratch. We also use digitized video frames for compositing with AfterEffects. Some of our more involved title sequences have also been generated using 3D software. For example, we illustrated how a comet called Temple-Tuttle has been leaving a debris trail that creates the yearly Leonid meteor shower. These animations were distributed over NASA TV as part of the daily Video News File program. Of the events that Ames has done as Webcasts, those that featured a lot of talking, such as speeches and press conferences, gained the least from having a video feed. The audio delivered most of the pertinent information and sounded much better relative to the quality of the video over the Web. You could get just as much out of the event by listening to it as you would a radio. What seems to interest more people from a visual standpoint are unusual events, such as the installation of a new model in a wind tunnel. Those have more of a visual appeal because of their uniqueness, and people are more accepting of the Web-quality video. Last year, we worked with the Air Force to produce a live video Webcast from an aircraft flying over the Mediterranean. 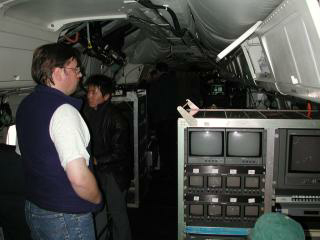 In that case, we were simply showing feeds from cameras observing the Leonid meteors at high altitude and the researchers who were working at their instruments on board the plane. Even though it wasn't a particularly fast-frame rate, the simple fact that it was coming from an airplane halfway around the world was a real attraction. Ed Schilling performs High Definition TV imaging and slit-less spectroscopy in support of outreach and science. The High Definition TV imagers are used both for imaging and optical spectroscopy.